For chemical and food processing or general manufacturing environments, there’s a BenchMark™ scale to fit your needs. 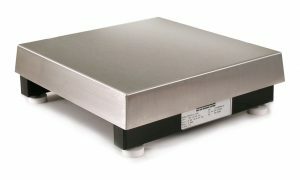 NTEP-certified BenchMark scales provide true industrial solutions in demanding weighing applications. The BenchMark SL Series offers remarkable precision and a sanitary surface for bench-top weighing in food and chemical processing environments. Light-Capacity Weighing with Durable Stainless Steel Load Cell Built of industrial-quality 304 stainless steel, the Benchmark CW-80B is tough and accurate. The unique LifeGuard base design provides unparalleled load cell protection by isolating the load cell from mechanical overloads and shock loads. The CW-80B’s stainless steel load cell is highly durable and corrosion resistant for hostile environments. It?s ideal for dry food and chemical processing, rugged industrial use, and general purpose weighing. Extremely Accurate Medium-to High-Capacity Weighing The Benchmark is available with a mild or stainless steel frame. Heavy-duty construction provides ultimate durability, sensitivity, and long life for a variety of demanding industrial weighing environments. All Benchmarks come with a sanitary stainless steel cover.